Doubleday Field resonates with the true spirit and integrity of "America's Favorite Pastime"
The grand game of baseball cannot be better expressed than watching a game at Doubleday Field in Cooperstown, NY. 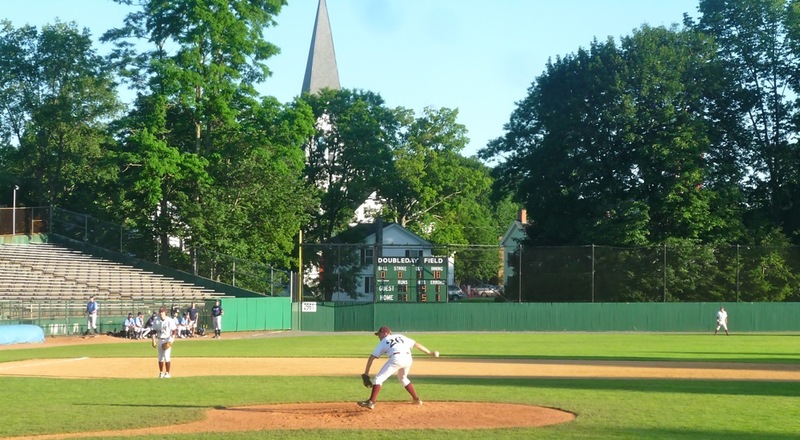 The hope that baseball players play the game for only the love of their hobby or profession is fully realized everyday --three games a day during the baseball season -- on Doubleday Field's plush green field and perfectly manicured diamond. The seating capacity is 9,800, admission free and the experience priceless. Named after Abner Doubleday (1819-1893), a Union Army General and allegedly the originator of baseball, Doubleday Field is as real as baseball stadiums get. Major League parks may try to create an intimate setting, but Doubleday Field was born that way and never strayed. What a treat it is for the fans to sit in the Cooperstown sunshine watching ballplayers hustling like there is no tomorrow and having a good time in the process. The experience may be amateur, but it is major league in every way as the passion that the ball players display faithfully carries on in the tradition of America's favorite pastime at the "Birthplace of Baseball" in Cooperstown NY. The charming 19th century-like entrance, the covered grandstand behind home plate, and bleachers encompassing the rest of the field resonate with baseball pride. The stands have interesting nooks and crannies, with the field being surrounded by beautifully mature trees, well maintained homes (sometimes the victim of home runs breaking windows) and a lovely church steeple.The Village of Cooperstown, Doubleday's owners since 1919 (and with some great fundraising support for renovations from the Ohio-based Friends of Doubleday) have clearly shown a deep respect for this national landmark by keeping the history intact, the game alive every baseball season day, and making sure the future of Cooperstown includes Doubleday Field. This type of preservation ultimately gives baseball fans a place of baseball solace, knowing that they can catch a ball game with integrity, passion and spirit intact. --played on a field so historic, friendly and attractive that it will give even the most passive baseball fans goosebumps.